Many a times we may need to get the Time, Hour, Minute, Second and Millisecond Part from DateTime in Sql Server. In this article we will see how we can get these parts of the DateTime in Sql Server. Following demos shows how to get some of the commonly required Time Part format from a DateTime. Note this script will work in sql Server 2008 and above as here I am using TIME datatype and SYSDATETIME() functions which were introduced in Sql Server 2008. 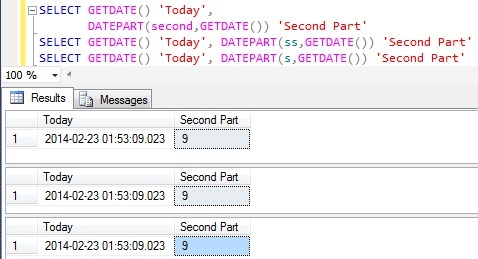 We can use DATEPART() function to get the HOUR part of the DateTime in Sql Server, here we need to specify datepart parameter of the DATEPART function as hour or hh. We can use DATEPART() function to get the MINUTE part of the DateTime in Sql Server, here we need to specify datepart parameter of the DATEPART function as minute or mi or n.
We can use DATEPART() function to get the SECOND part of the DateTime in Sql Server, here we need to specify datepart parameter of the DATEPART function as second or ss or s.
We can use DATEPART() function to get the MILLISECOND part of the DateTime in Sql Server, here we need to specify datepart parameter of the DATEPART function as millisecond or mi . Thank you Mr. Biradar this was really helpful. That was extremely helpful. This is how to replace a null date with a new date and the current time: ISNULL(,CAST((‘2010-1-1 ‘+CONVERT(VARCHAR(8), GETUTCDATE(), 108)) AS DATETIME)). This is useful when you store as utc and convert to local time for display. Jeje! Amigo, eres un kurdo. Excelente tutorial. Buena explicación y dinámica. Me sirvió. Agradezco tu consejo. Excelente, mejor explicación no pude encontrar. I’m already get result time using ‘Demo 1’ for example Time1 and Time2, but the datatype result of ‘Demo 1’ is in varchar. My Question is how to subtract between two times ? how to get output using sql select ..i.e. select floattotime from table.. I have been searching for days trying to find something to convert time from 24 hour to 12 hour. Most people said it couldn’t be done or they provided solutions that didn’t work. This did the trick so thank you so much!!! Really Very Help For Me.